#1 King Philip, 1 vs. #4 Braintree, 1 – Final (Braintree 4-3 on PKs) – King Philip senior captain Cam Mullins scored on a free kick from 25 yards out to give the Warriors the lead early on but Braintree leveled before halftime. The Wamps won 4-3 on penalty kicks. #11 Oliver Ames, 1 @ #3 Dartmouth, 4 – Final – Dartmouth scored just before halftime to seize the lead and the momentum. OA junior Matt Alvarado leveled the game early in the second half but Dartmouth regained the lead right back. With the Tigers pushing numbers forward for the tying goal, Dartmouth added a pair of insurance goals. #13 King Philip, 1 @ #5 Oliver Ames, 3 – Final – Click here for a recap of the game. #8 North Attleboro, 0 @ #1 Natick, 2 – Final – Click here for a recap of the game. #6 Milford, 0 @ #2 Canton, 3 – Final – Click here for a recap of the game. Canton, 1 @ Stoughton, 3 – Final – Stoughton picked up a win over Canton for the first time in program history with a 3-1 victory. Val Whalen led Stoughton’s offense with 18 kills while Molly Turner had 14 assists. Christina Gelin, Riley Bagley and Whalen combined for over 70 digs. Canton’s Emma Murphy and Casey Shea each had nine kills and Emma Gobbi added four kills. Nicole Poole finished with 26 assists for the Bulldogs. Oliver Ames, 0 @ Mansfield, 3 – Final – Mansfield defended home court with a 25-15, 25-20, 25-21 sweep. Emily Kleber paced Mansfield with 10 kills while Jess Haradon had 16 digs and nine service points and Chloe Peters had 28 assists. 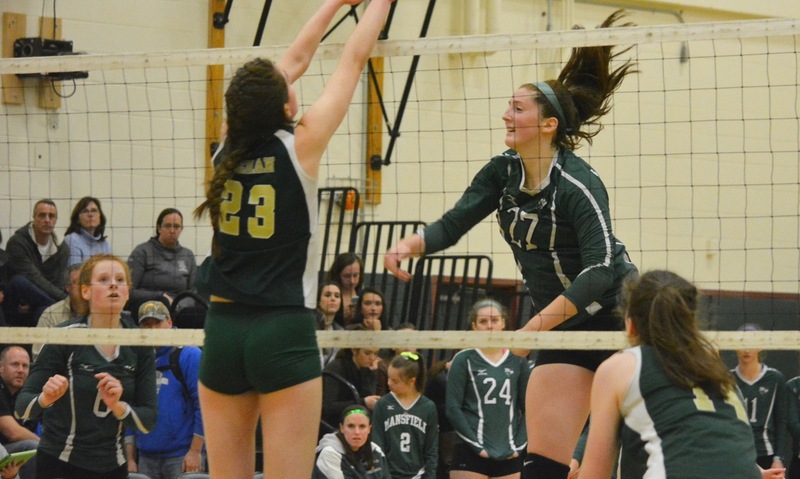 Franklin, 1 @ King Philip, 3 – Final – King Philip notched a 25-21, 24-26, 25-13, 25-22 win over Franklin. Sydney Phillips had 17 kills and two blocks, Carly Adams added 21 assists and three kills, Amanda Loewen had seven digs, Emma Lopez chipped in with nine digs and Angela Vellante and Molly Croke combined for 11 digs. For Franklin, Maddie Kuzio had 39 digs, Erin Skidmore and Maggie Doyle each had eight kills and Meaghan Maguire notched six blocks. Taunton, 4 @ Attleboro, 1 – Final – Taunton had four different players find the back of the net to get the win. “The team played very well both offensively and defensively,” Taunton head coach Liz Hathaway said. “This was a total team victory and everyone brought their A game.” Kya Enos, Lauren Torres, Annie Tate and Lianda Duarte scored for the Tigers. Duarte, Torres and Enos each had an assist as well. Emma Sheehan earned the win in net with seven saves. Franklin, 0 @ King Philip, 0 – Final – Franklin sophomore goalie Christina Lucini made 14 saves and junir Kate Morse had two saves herself as Franklin clinched the Kelley-Rex title. Franklin head coach Lisa Cropper said Kayla Marshall, Caroline Lounsbury and Dana Lewandowski all had strong defensive games for the Panthers. King Philip, 3 @ Attleboro, 0 – Final – King Philip went on the road and picked up a convincing 25-13, 25-14, 25-6 win. Sydney Phillips led KP with nine kills while Liv Balduf added six kills and Jess Stoffel had a pair of kills and a pair of blocks. Amanda Loewen chipped in with two aces, one kill and four digs while Carly Adams finished with 19 assists. North Attleboro, 0 @ Canton, 3 – Final – Erika Lum led the Bulldogs with 11 kills, hitting at a .323 clip. Casey Shea had six kills and Emma Murphy chipped in with five blocks, four kills and five digs while Nicole Poole had 21 assists and four kills and Julia Panico had 21 digs. Sharon, 3 @ Foxboro, 2 – Final – Sharon junior Jess Allan led the Eagles’ offense with 13 kills and a 93% serving average while classmate Cori Jermyn added three aces. Natalie Kane added four kills and Faythe Gomolka had 12 assists and four aces. Mansfield, 3 @ Taunton, 0 – Final – The Hornets opened their Kelley-Rex slate with an impressive road win at Taunton, picking up a 25-19, 25-21, 25-19 win. Julia Harrison had a strong serving day, picking up 12 service points and finished with seven kills. Emily Kleber added nine kills for Mansfield while Chloe Peters had 28 assists. Oliver Ames, 0 @ Franklin, 3 – Final – Franklin earned the sweep over Oliver Ames with a 25-17, 25-15, 25-20. Erin Skidmore had five kills, five digs and four aces, Maggie Doyle had four kills, three aces and a block and Lizzie Boynton added six assists and four aces for the Panthers. 1st Quarter: (C) Leonard 2 yard rush, Albetal XP good; (C) Hayes 5 yard rush, Albetal XP good. 2nd Quarter: (A) Sam Corrado 18 yard rush, XP no good; (A) Tyler McGovern 8 yard rush, T. McGovern 2pt pass to James Weir; (A) T. McGovern 1 yard rush, XP no good. 4th Quarter: (A) T. McGovern 37 yard pass to J. Weir, T. McGovern 2pt pass to J. Weir. 1st Quarter: No Foxboro scoring, two Hingham touchdowns. 2nd Quarter: (F) Mark Clagg 9 yard pass to Paul Darcy, John Whitehouse 2pt conversion; (F) M. Clagg 13 yard pass to J. Whitehouse, XP no good. 4th Quarter: (F) M. Clagg 21 yard pass to J. Whitehouse, XP no good; (F) Anthony Capachietti 61 yard rush, XP good. 1st Quarter: (S) Ryan Sullivan 2 yard rush, XP no good; (S) Marselis Cox 45 yard fumble return, Dave Cellucci 2pt rush; (S) Izon Swain-Price 8 yard rush, Antonio Amado XP good; (S) Justin Ly 10 yard rush, XP no good. 2nd Quarter: (S) R. Sullivan 5 yard rush, A. Amado XP good; (F) Jake Wolowacki 1 yard rush, XP no good; (F) Jake Noviello 40 yard pass to J. Wolowacki, 2pt no good; (S) R. Sullivan 10 yard rush, XP no good. 3rd Quarter: (S) R. Sullivan 52 yard rush, XP no good; (F) J. Noviello 68 yard pass to Kinley Baird, XP no good. 4th Quarter: (S) I. Swain-Price 40 yard rush, XP blocked; (S) David Bell 34 yard rush, XP no good. 1st Quarter: (NA) Chad Peterson 15 yard pass to Bobby Mylod, Geoff Wilson XP good. 2nd Quarter: (KP) Sean Garrity 26 yard rush, Matt Franz XP good. 3rd Quarter: (KP) Brendan Lydon 48 yard pass to Mike Mello, XP no good. 4th Quarter: (KP) S. Garrity 12 yard rush, XP no good. 1st Quarter: (M) Diogo DeSousa 38 yard field goal good. 2nd Quarter: No Mansfield scoring. 3rd Quarter: No Mansfield scoring. 4th Quarter: No Mansfield scoring. 1st Quarter: No Milford scoring. 2nd Quarter: (M) Sean Lehane 36 yard field goal good. 3rd Quarter: No Milford scoring. 1st Quarter: (OA) Kyle Gagliardi 1 yard rush, 2pt no good; (OA) K. Gagliardi 20 yard pass to Ralph Delorus, Liston Funai 2pt rush; (OA) Jay Fruci 3 yard rush, L. Funai 2pt rush. 2nd Quarter: No Oliver Ames scoring. 3rd Quarter: No Oliver Ames scoring. 4th Quarter: (OA) K. Gagliardi 12 yard run, Anthony Berksza XP good; (OA) Michael Mulrean 50 yard interception return, XP no good. 1st Quarter: (S) Xavier Hackett 75 yard kick return, 2pt no good. 2nd Quarter: (S) X. Hackett 65 yard interception return, 2pt no good. 3rd Quarter: No Sharon scoring. 4th Quarter: (S) Drew Naisuler 2 yard rush, Aaron Strong 2pt rush good. 1st Quarter: (T) Noah Leonard 11 yard pass to Max Moitoso, XP no good. 2nd Quarter: (T) TJ Mendes 4 yard rush, N. Leonard 2pt pass to Adam McLaughlin; (T) N. Leonard 20 yard pass to A. McLaughlin, John Teixeira XP good. 4th Quarter: (NB) Nigel Palmer 68 yard rush, 2pt not good; (T) T. Mendes 4 yard rush, J. Teixeira XP good. North Attleboro, 0 @ Franklin, 2 – Final – Sophomore Nitin Chaudhury played the role of playmaker on Friday afternoon, assisting both of Franklin’s goals. Farley Asmath put the Panthers ahead and Kevin Hall doubled the lead for Franklin, both off of assists from Chaudhury. Milford, 0 @ King Philip, 2 – Final – Click here for a full recap of the game. Attleboro, 0 @ Canton, 2 – Final – Hannah Link and Sarah Collins each scored goals for the Bulldogs. Franklin, 1 @ North Attleboro, 2 – Final – Nadia Havens opened the scoring for Franklin with a header off a pass by Ellie Teixeira. Haley Guertin scored an unassisted goal to tie it for North eight minutes later. With eight minutes remaining, Kayla Pasquel won the game for the Rocketeers with an unassisted goal. King Philip, 3 @ Milford, 0 – Final – Milford coach Jay Mastaj credited Rachel LeBlanc with a solid game on defense for the Hawks. Mansfield, 2 @ Canton, 3 – Final – In a battle between defending division champions, the match went the full distance. Canton emerged with a 25-23, 20-25, 12-25, 25-22, 15-9 win over the Hornets. Hannah Jerrier led the Bulldogs’ attack with 12 kills while Erika Lum and Cassie Loftus combined for 13 kills from the weak side. Nicole Poole put Canton’s offense in motion with 32 assists while Emma Murphy had an outstanding night defensively at the net with nine blocks. Head coach Pat Cawley also noted the strong defensive games from Maria Mackie and Emily Lynch. For Mansfield, Emily Kleber had seven kills, Julia Harrison has 11 kills and 12 digs and Meg Hill had 14 kills and six blocks. Foxboro, 178 @ King Philip, 168 – Final – Sebastian Ladoulis of KP was the low round of the match shooting a 41. Foxboro’s Logan Sloan was a co-medalist, also shooting a 41 on the day. North Attleboro, 156 @ Sharon, 160 – Final – Sharon’s Max Avratin had the low round of the match with an even par 36. David Colasanti led North with a 37.